Would you like to see a sidearm called “The Last Dance”? How about four? How about yet another set of Tangled Web Grips? Maybe a pair of Vigil of Heroes hunter boots… or six? 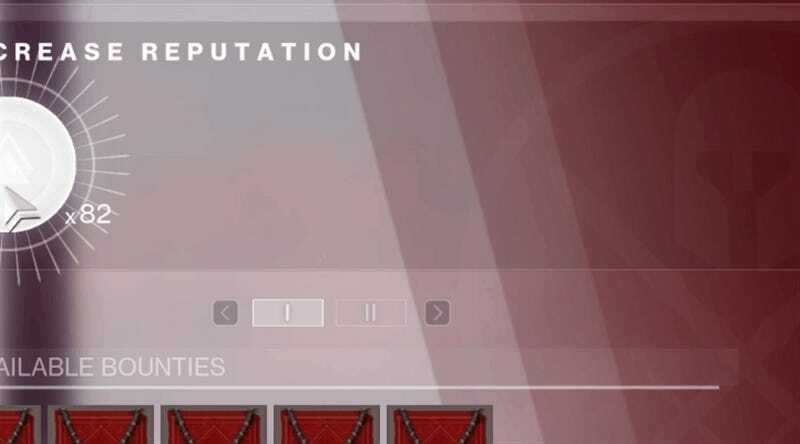 Thanks to how Destiny 2 now handles loot, I’ve got all of those and many, many more. A lot of the changes Bungie has made to Forsaken are designed to make Destiny 2 more like its predecessor. Most of those changes, particularly those concerning PvP balance and weapon loadouts, have made things more fun. Another one, the addition of randomized perks to most weapons and armor, has made the game more rewarding in some ways, but added a lot of clutter and busywork in the process. Each gun and piece of armor in Destiny has one or two perks, each of which gives it a small but often noticeable extra attribute. One might make a semi-auto gun fire full-auto; another might enhance the weapon’s range when you aim down your sights. When Destiny 2 came out a year ago, every weapon had a set collection of perks. It was a significant change from the first game, in which random perks—“random rolls,” in the parlance—meant that each Hopscotch Pilgrim pulse rifle I got was slightly different than the last one. Some perks were better than others, and players eventually agreed on the best perk combination for a given weapon, which was dubbed a “god roll.” It was no longer enough to get a gun you really wanted; even if it finally dropped for you, chances were it would have at least one trash perk. You’d still be faintly disappointed, which would motivate you to keep playing in pursuit of a better roll. Unless you were lucky, you’d have to get a weapon numerous times before you got anything approaching a god roll. Armor also had random perks, and while armor perks generally aren’t as exciting or crucial as weapon perks, there was still something satisfying about slowly assembling a set of armor that perfectly amplified your play-style. Your gauntlets might reload your chosen weapon-type faster, while your helmet might reward you for your frequent grenade use. Your boots could carry more ammo for your preferred heavy weapon, and your chestpiece could amplify your super ability of choice. Crafting a perfect Destiny loadout could take many hours of grind and dozens of duplicate loot drops. Destiny 2 did away with that, meaning that every version of a gun or piece of armor you got was the same as all the other ones. It was a player-friendly decision, though its implementation left something to be desired. I’ve long been critical of double-random loot in games due to how gambly and manipulative that kind of system can feel, but after a few months with vanilla Destiny 2, the non-randomized weapon drops became uninteresting. There aren’t actually all that many perks in Destiny’s system to begin with, let alone good perks. There wound up being only a few truly desirable weapons during Destiny 2's first year, and once you had one of each, that was that. Oh great, another identical Midnight Coup. Another identical Antiope-D. Another Tarantula. This outlaw + kill clip Go Figure I got last week has proved to be pretty nasty in Crucible. Since Forsaken and its accompanying 2.0 update, random rolls are back on the menu. When I get a duplicate drop of a Forsaken weapon I like—say, the pulse rifle Go Figure—my attention perks up in a different way than it used to. I pop over to my inventory and check it out to see which roll I got. If it’s a good roll, I naturally crow about it into party chat, and everyone I’m playing with will ooh and aah. (Or, more often, they’ll express frustration that they never get good rolls on anything.) The whole thing still gives me that mild gambler’s thrill, like opening up a new pack of Pokémon or Magic cards to see if I got anything rare. I can’t deny that it’s a little exciting, and given that playing Destiny in the first place means willingly feeding yourself into an exploitative system of shifting goalposts and endless grind, what’s a little more randomness on top of that? The clutter in my storage vault is due not to bad rolls or good rolls, but everything in between. Sometimes when I get a drop, the weapon or armor piece is obvious garbage. The new perk system occasionally even assigns perks that are inconsistent with how people play the game. Why does “primary ammo finder” even exist as an armor perk, given how common that ammo type is? Why on earth would I want a hip-fire bonus on a sniper rifle, which is almost always aimed down a scope? I dismantle the worst weapons and armor immediately. Exactly two times, I’ve gotten what amounted to god-rolled weapons; those ones get saved, locked, modded, and eventually, masterworked. The Go Figure in the screenshot above is one of those, as is the full auto + rampage Bygones pulse that dropped for me during a Gambit match. Both are amazing rolls, and both feel a little special, since few other players will get those precise perk combinations. The majority of the time, however, the gear I get falls somewhere in the middle. Maybe it’s got one good perk, and one perk I’m not sure about. If it’s armor, it works well with a weapon that I don’t use… but which I could come to use, depending on how Bungie might change the game in the future. Hmm, it’s a Tigerspite auto-rifle with triple-tap and graverobber. Seems bad… but maybe it’s not? I’ll keep it. Look, a Duke Mk. 44 hand cannon with rangefinder and kill clip. Seems kinda good? I don’t know. I’ll keep it. 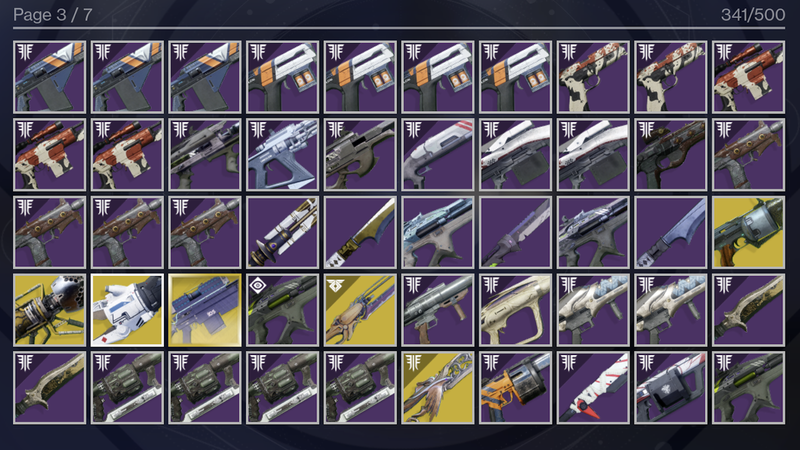 As a result, I store a lot more weapons and armor than I dismantle, always with the feeling that I’ll go through everything at some point and figure out what I actually want to keep. (It’s a good thing Bungie has expanded Destiny 2’s storage vault to accommodate 500 items, significantly more than there were at launch. Mine is already well past halfway full.) Over my first three weeks with Forsaken, I’ve accumulated an outrageous amount of duplicate gear. My vault looks ridiculous, with many items appearing at least twice and often more. Those screenshots, taken this morning, don’t even tell the whole story. I’ve dismantled at least double the number of every item I currently have in storage. In a day or two I’ll do another big dismantling run, clearing out more items I’m sure I don’t want. Another day or two after that, I’ll be drowning in gear again. This sort of video-game hoarding is nothing new for Destiny or any other loot-centric game. In the first game, I had multiples of just about everything, and lived in fear of dismantling an item only to find that, months later, it had become the new meta. That’s going to be the case all over again in Destiny 2, particularly as Bungie expands the loot pool over the coming year. The number of duplicate drops the game gives me has been compounded by the fact that, at least for now, Bungie has seemingly removed all year-one armor and the majority of year-one weapons from the general loot pool, which reduces the number of possible items I can get from a given drop. None of this is a huge problem, exactly. It’s more of a pervasive inconvenience, and an example of one of the many trade-offs that Bungie is always in the process of making. In this case, the clutter and time-wasting inventory management are the downsides, and the newfound excitement (and gambling hook) of chasing perfectly rolled weapons is the upside. Destiny 2’s current glut of items and duplicates is only manageable thanks to outside apps that let you move items from your characters to your vault and back. Those range from third-party tools like the indispensable Destiny Item Manager (whose creator I actually spoke to for an article a few years back) and the Ishtar Commander phone app, to Bungie’s own website and app. It sure would be nice if some of that functionality finally made its way into the game itself, though I’m sure there are a number of logistical and technical reasons why that’s harder than it seems like it’d be from the outside.